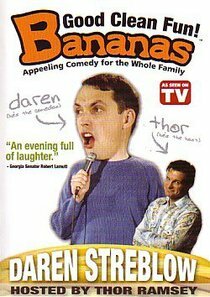 Laugh yourself happy with comedian Daren Streblow in this episode of the hit TV show Banana! This "appeeling" comedy show is more than just a guy on a stage. It's interviews of the not-so-serious kind, as well as some hilarious unscripted moments caught on tape. See Daren's side-splitting bit on the art of denistry and his over the top battle with buck teeth! From shy guy to human fly, Daren delivers the laughs! Best of all, its good clean frun for the entire family.^^Comedian Daren Streblow combines a wild imagination with a keen sense of humor making him an outstanding comedic performer. While viewing everyday life through his unique lens, Daren's audiences learn to take themselves, and life, a little less seriously. Daren Streblow has entertained thousands of people (most of the time intentionally) and it's easy to see why he has become one of the brightest comedians touring the country today. About "Bananas Featuring Daren Streblow"